Nescafe Gold Blend is made from a mix of arabica and robusta beans combined to create a smooth coffee that tastes bold and luxurious. Carefully selected, medium-roasted and freeze-dried to lock in flavour, this may be instant coffee, but that doesn't mean it lacks in taste. Sold in a premium 750g catering tin with click-to-close technology to lock in flavour and keep the coffee tasting fresh, this coffee will keep your workforce running at full strength. 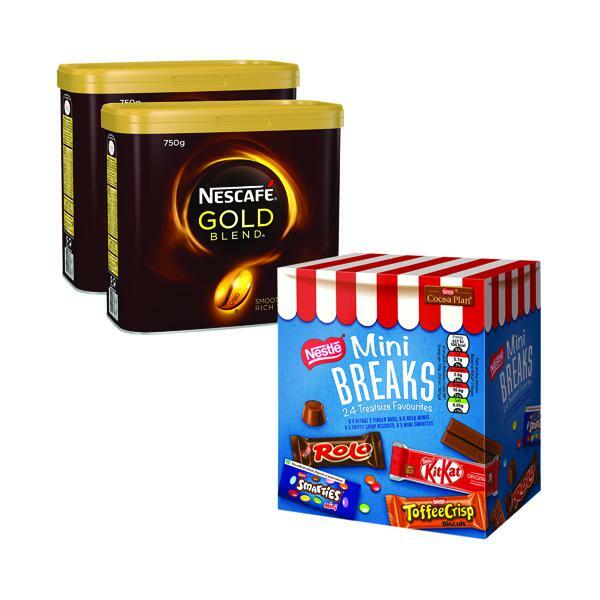 With this promotion you receive 2 x 750g tins of Nescafe Gold Blend coffee, plus a free box of Nestle Mini Breaks.